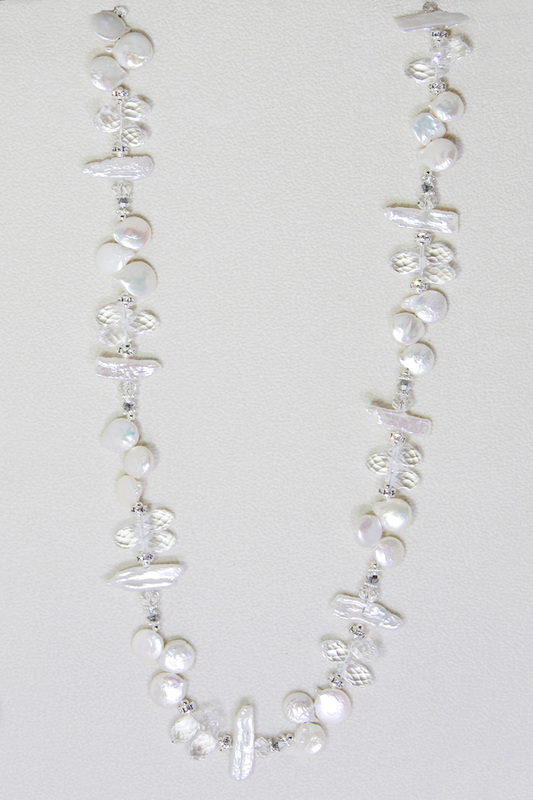 Cascading sterling silver pendants are strung on sterling silver wire with light azore Swarovski crystals and teardrop pearls. 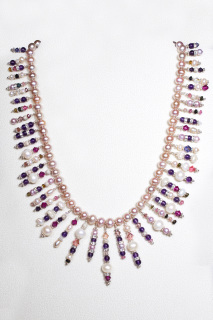 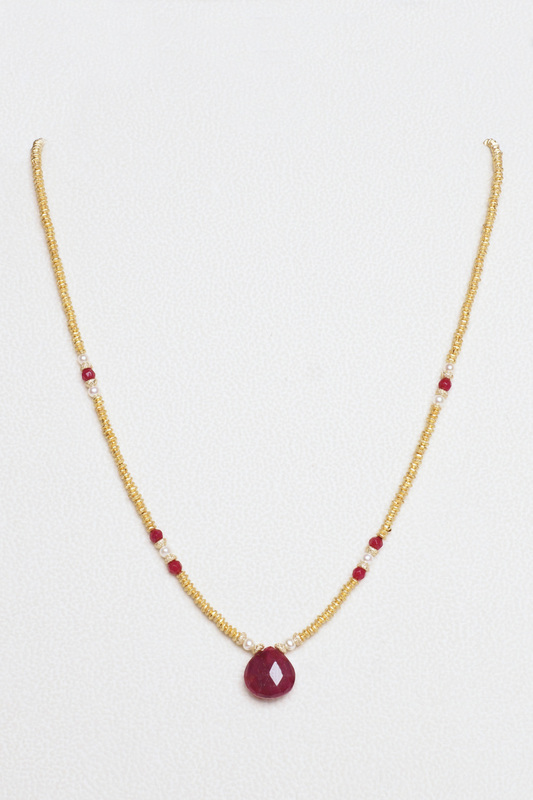 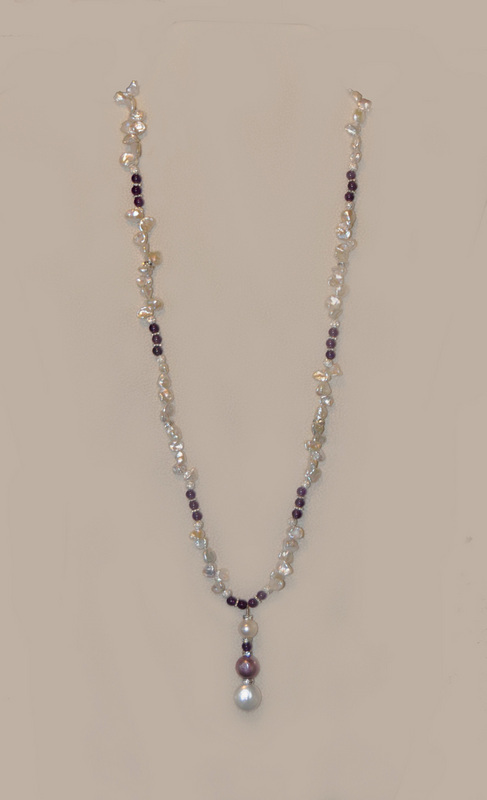 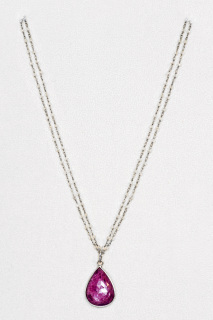 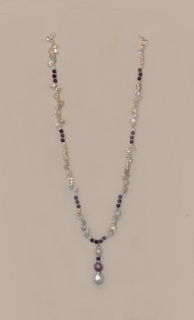 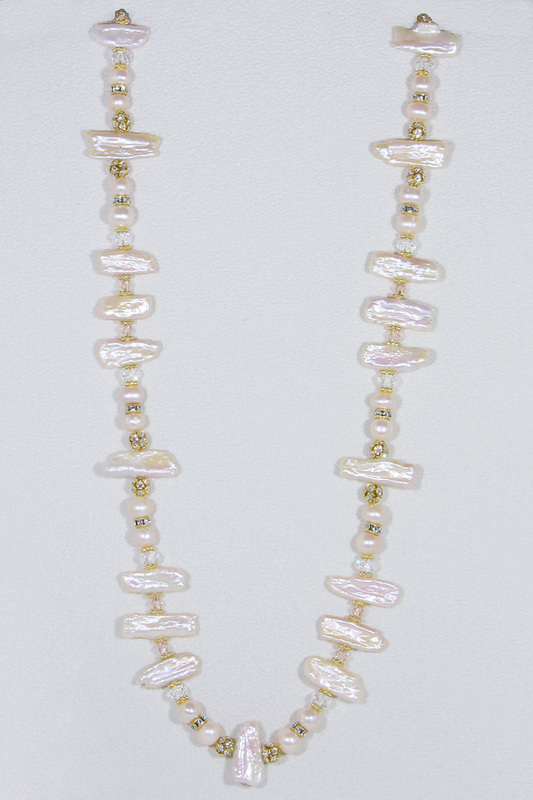 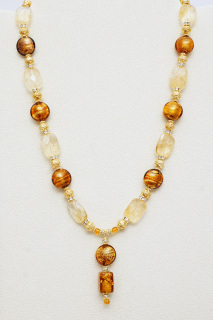 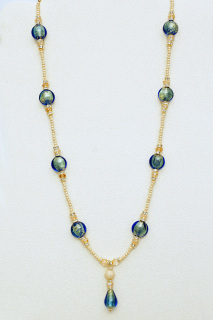 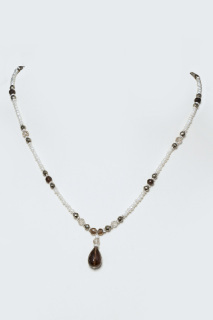 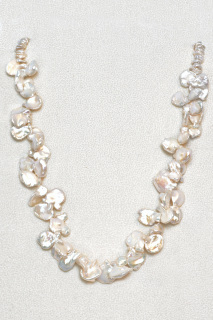 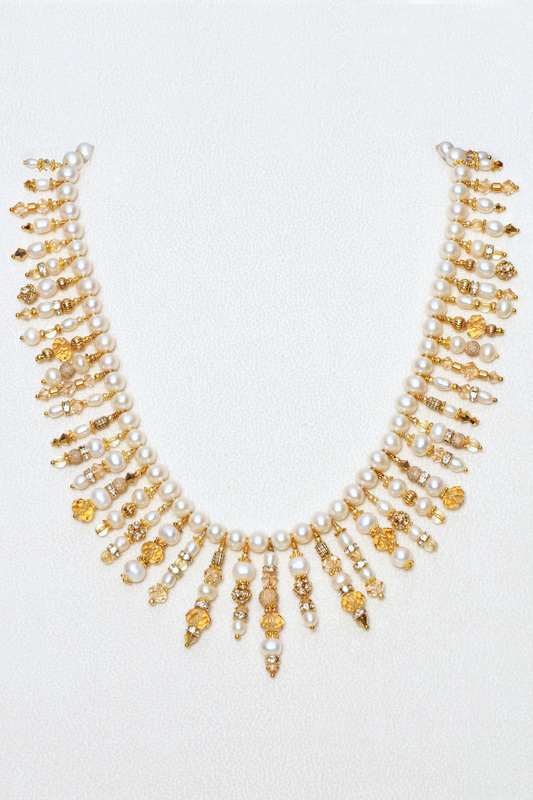 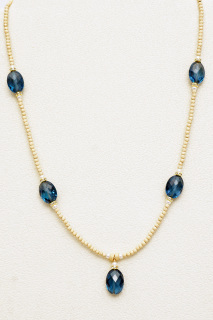 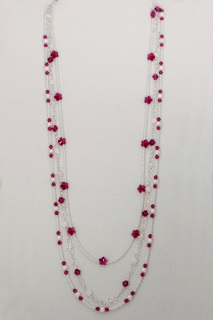 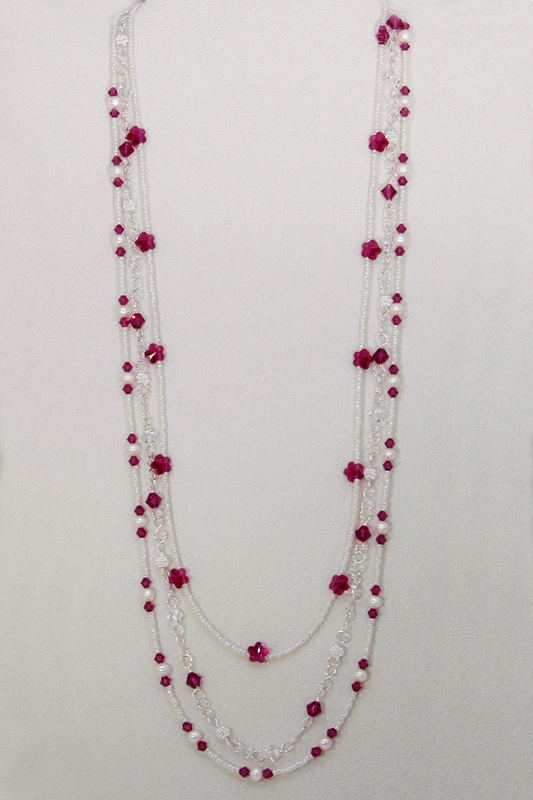 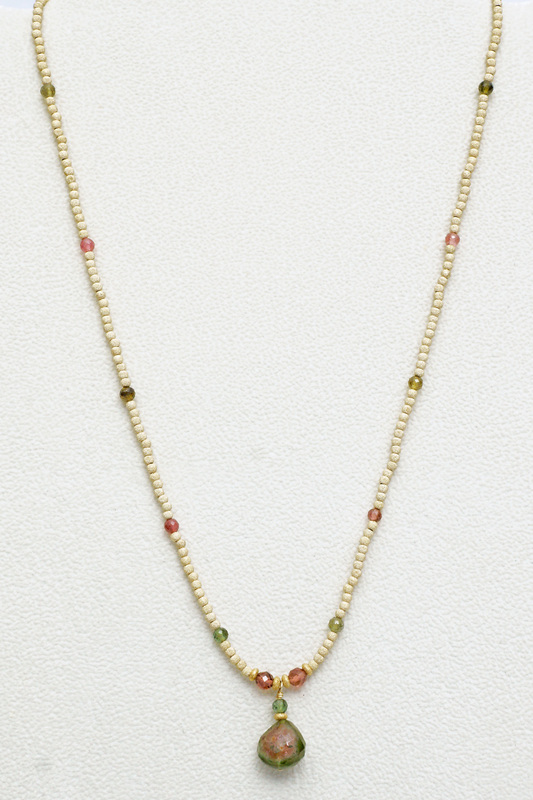 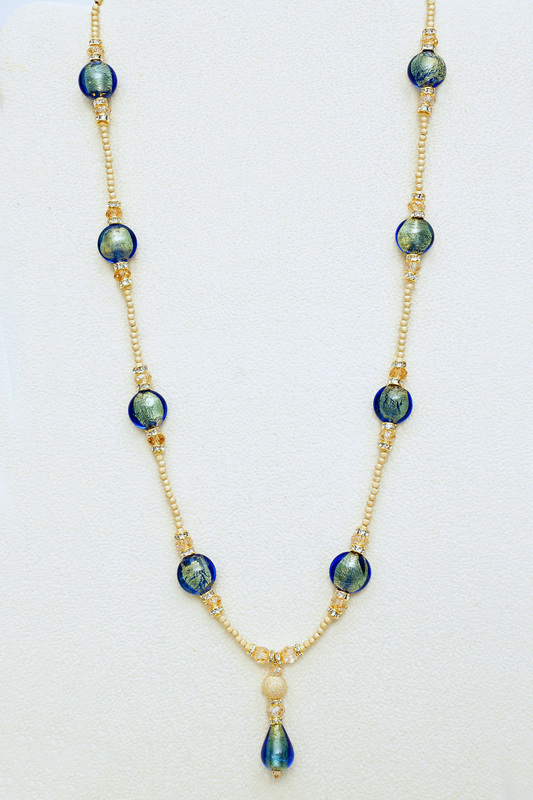 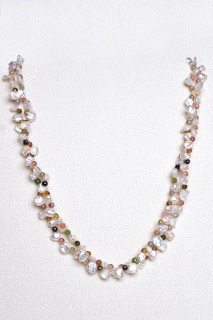 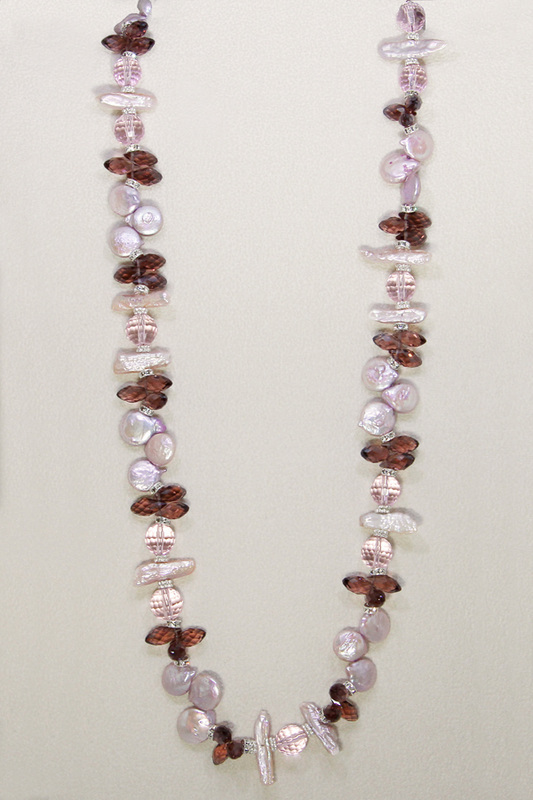 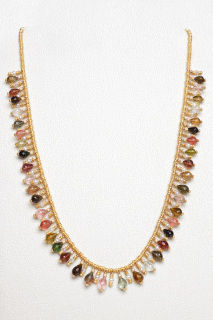 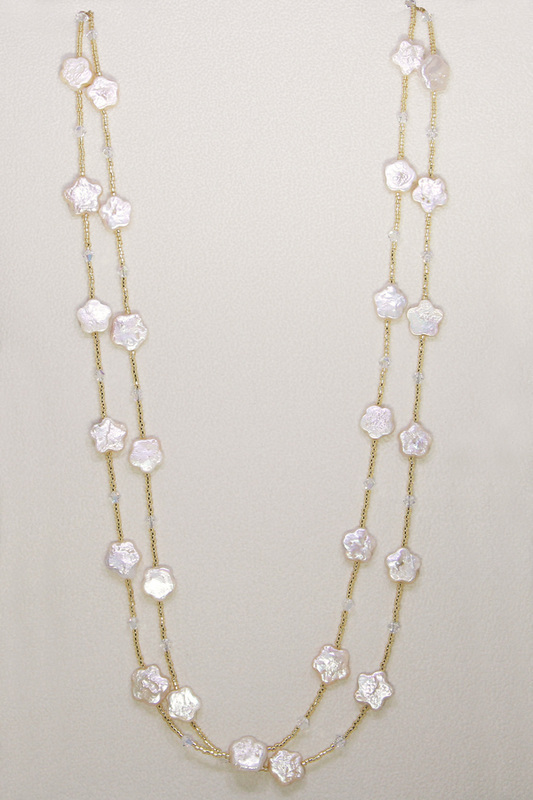 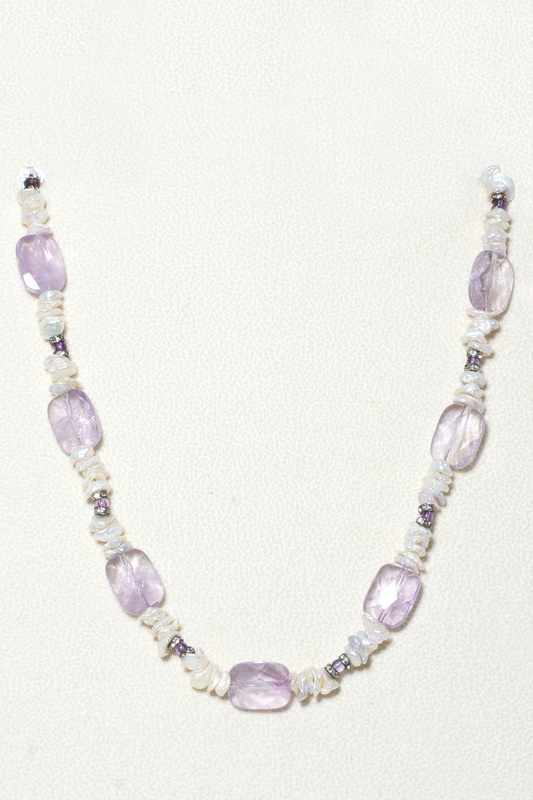 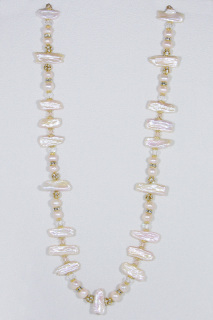 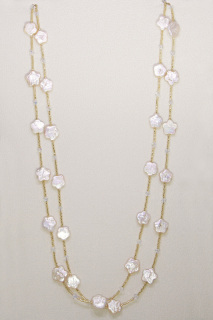 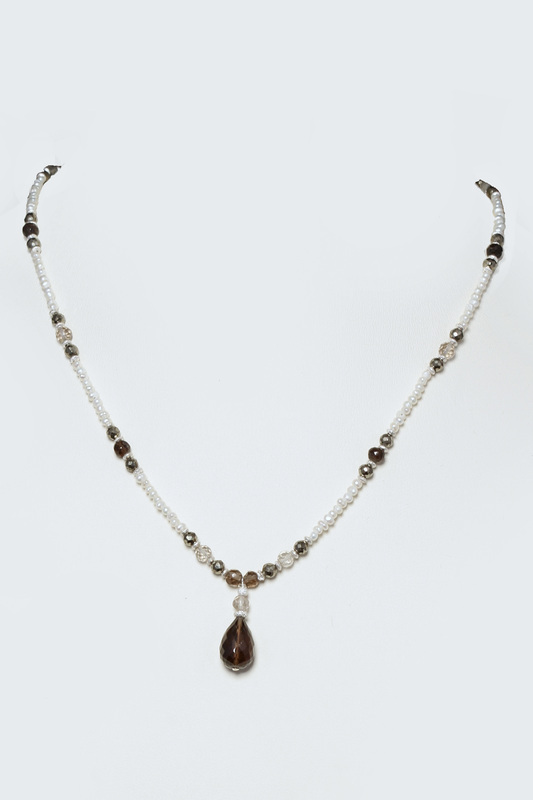 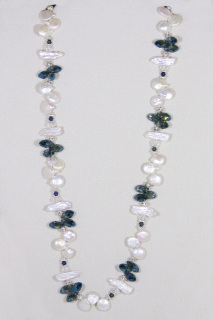 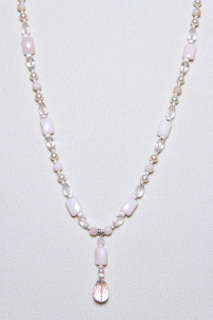 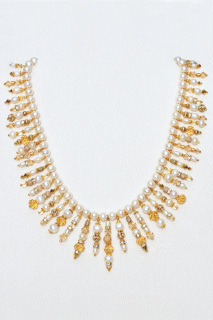 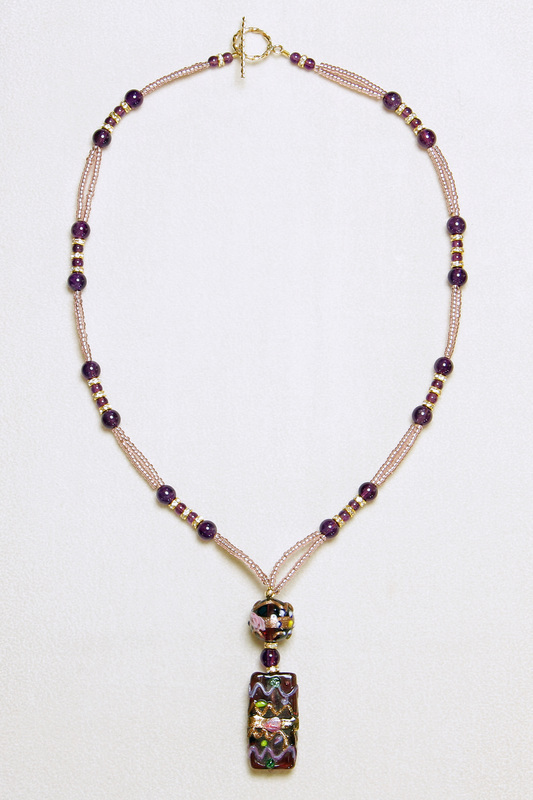 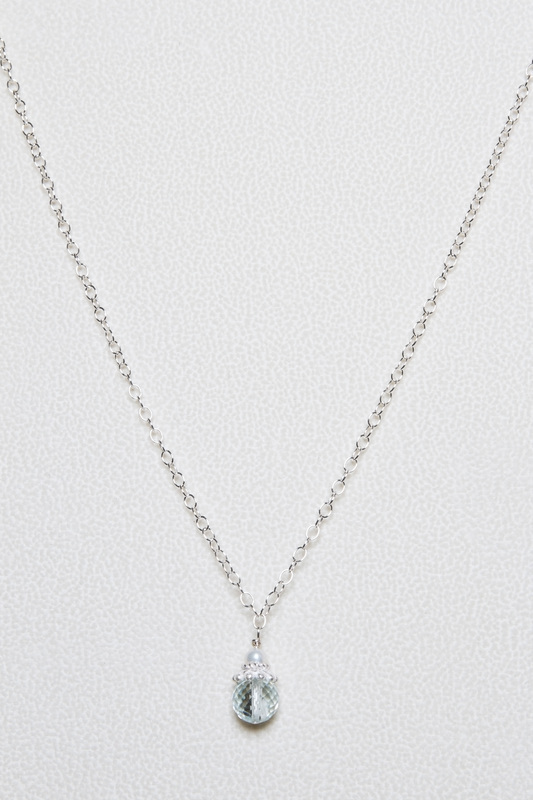 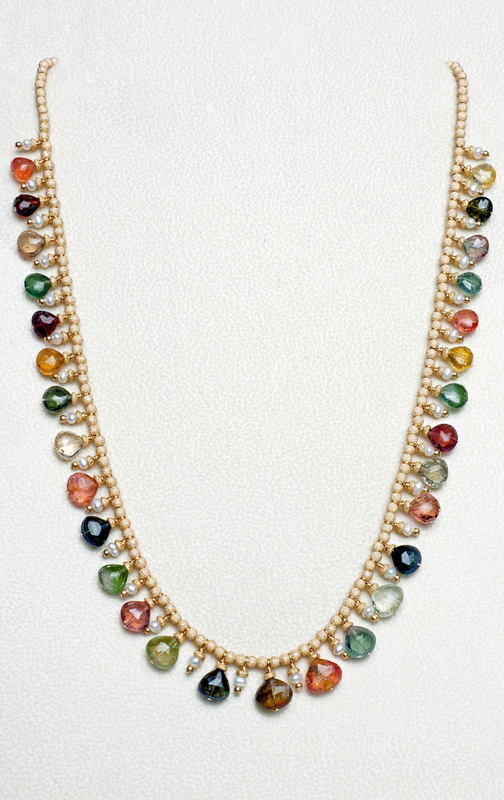 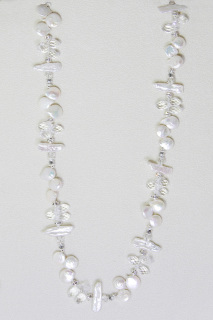 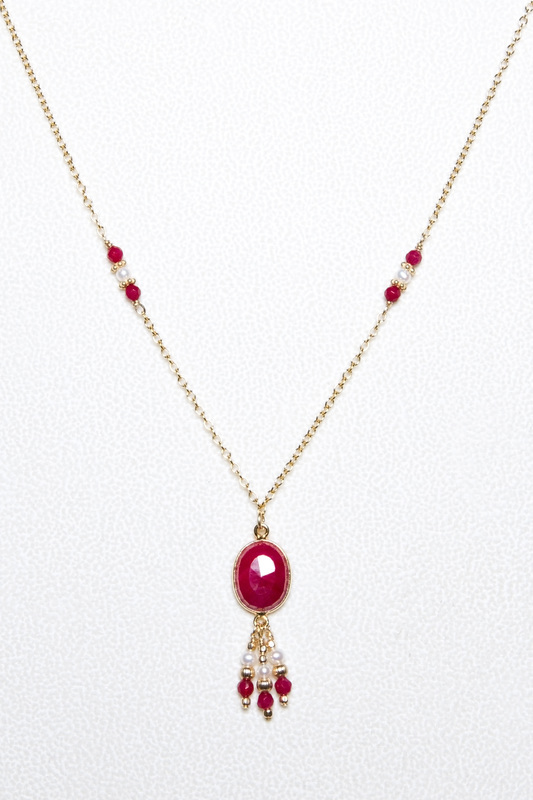 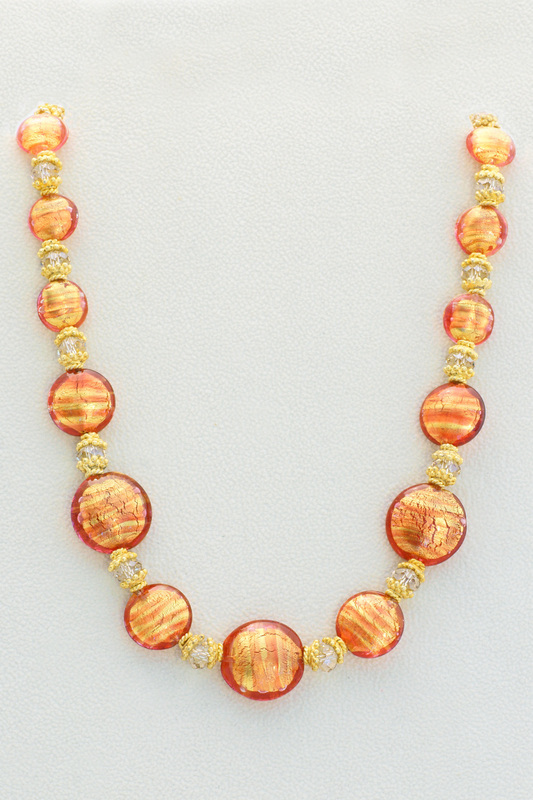 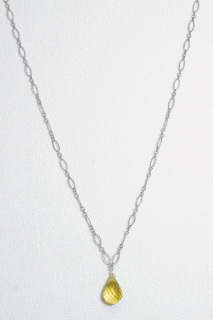 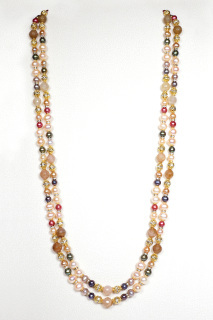 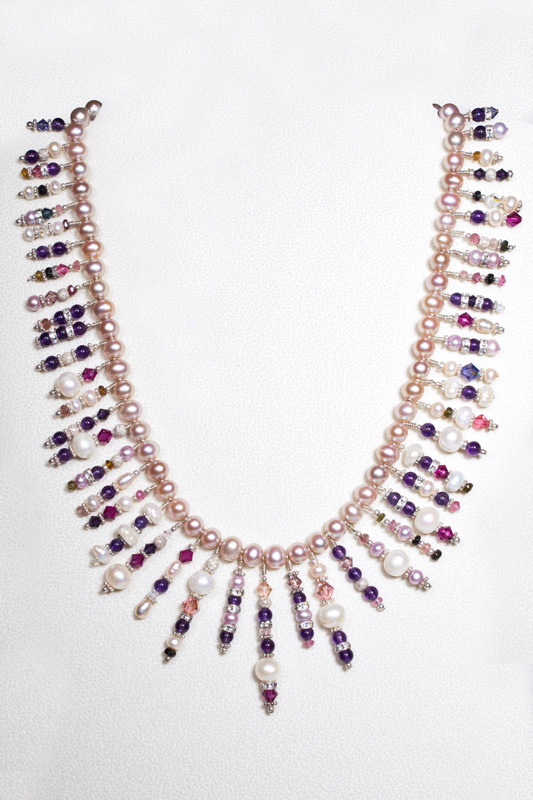 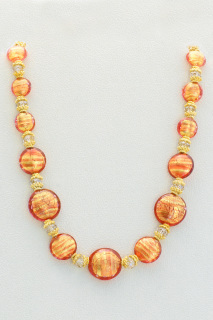 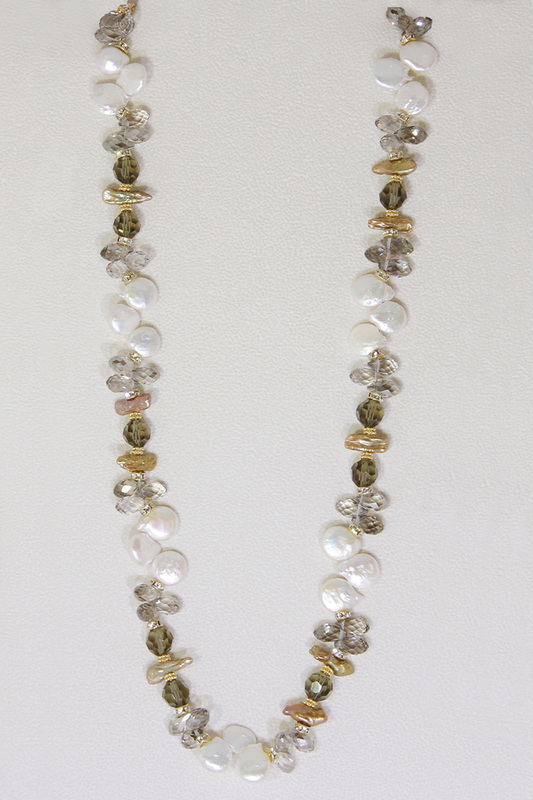 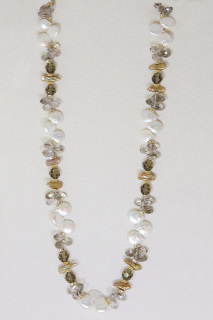 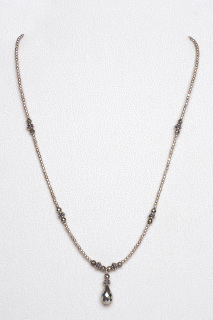 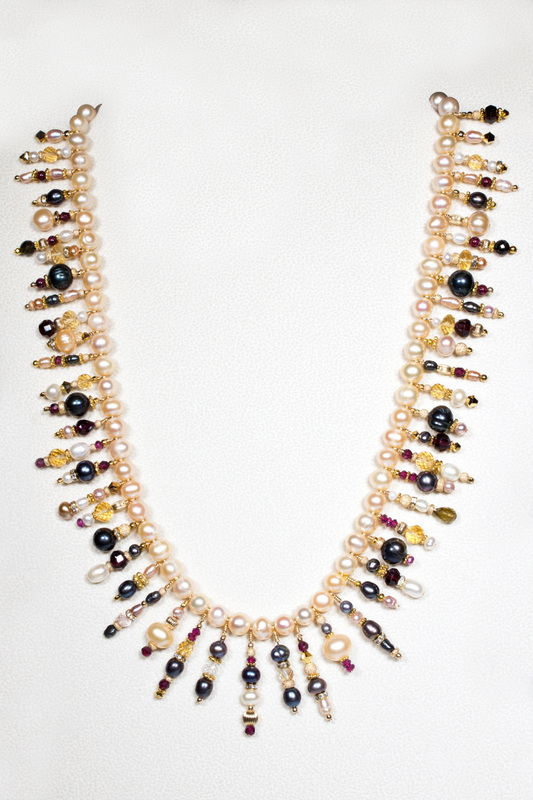 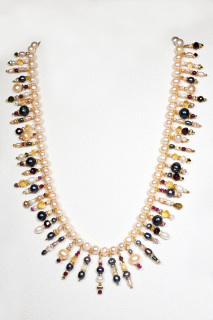 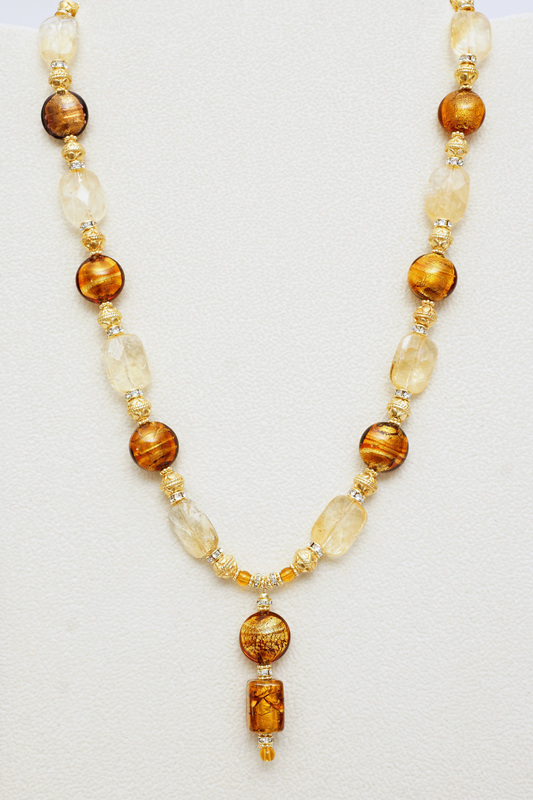 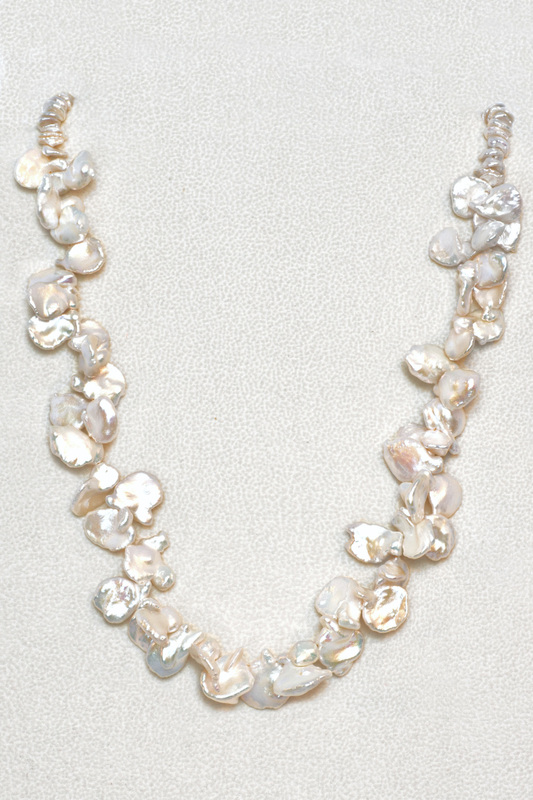 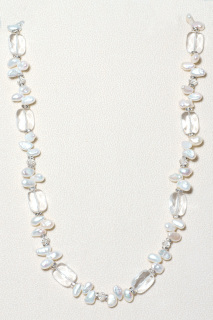 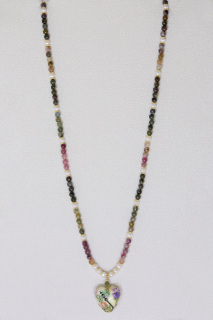 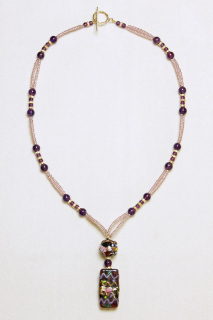 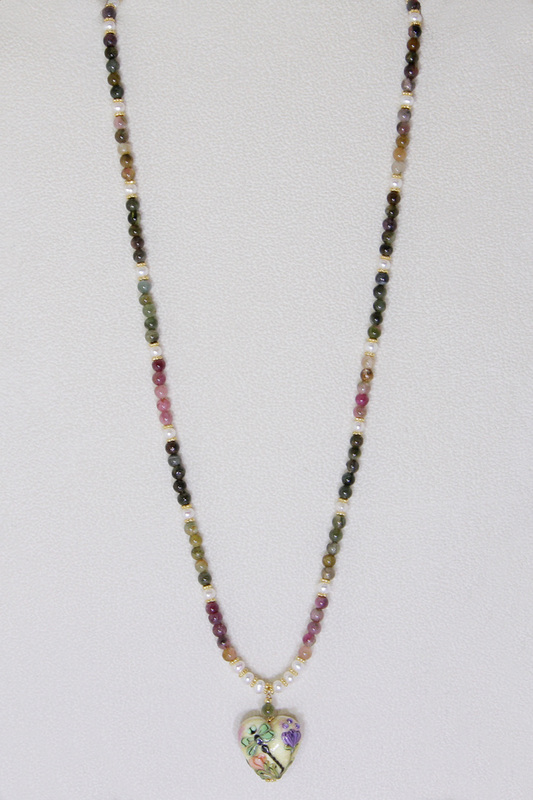 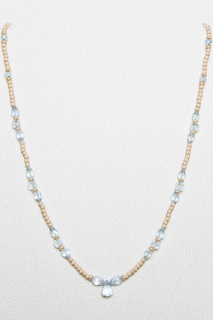 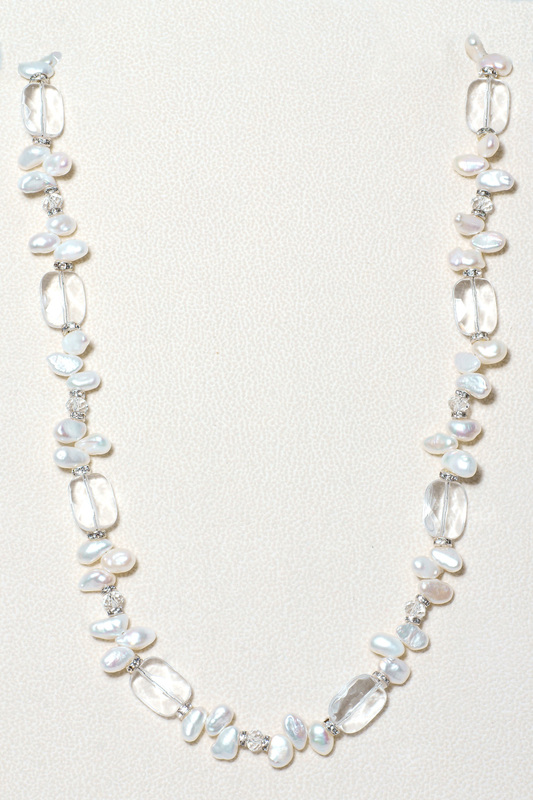 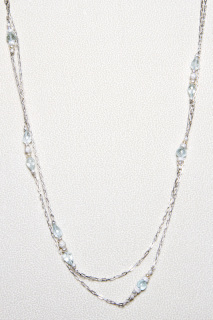 The 18” necklace contains alternating pearls and faceted round light azore Swarovski crystals. 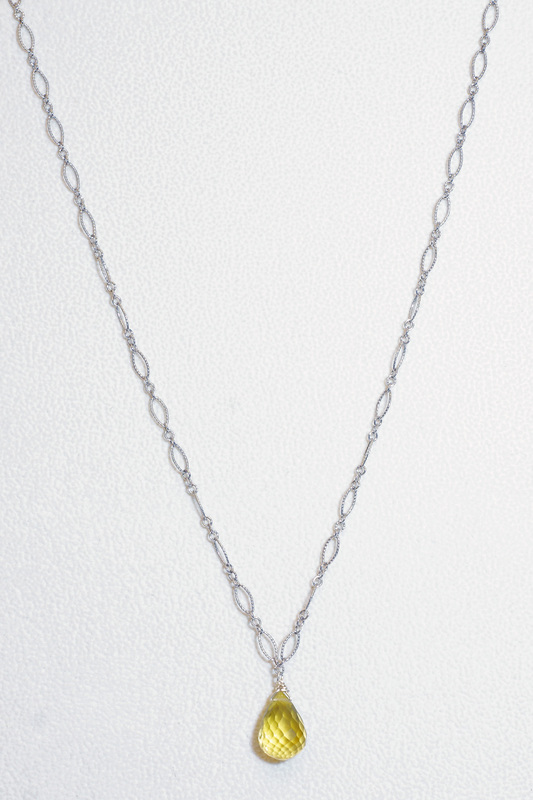 Sterling silver toggle clasp. 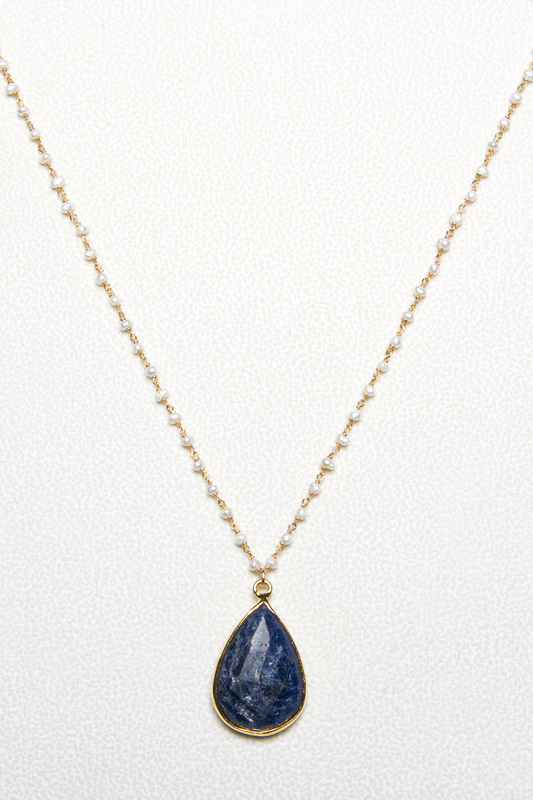 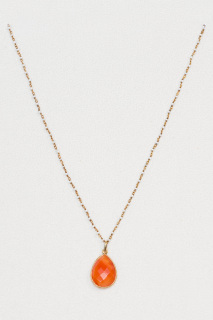 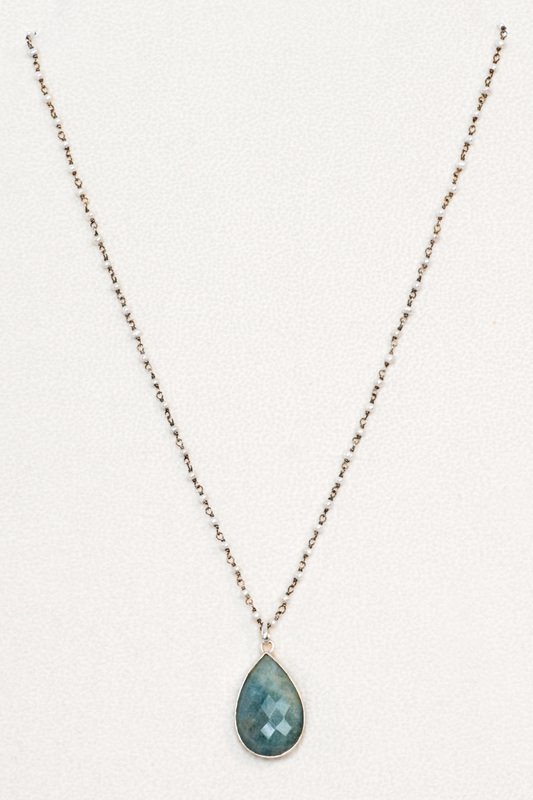 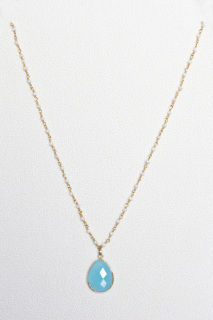 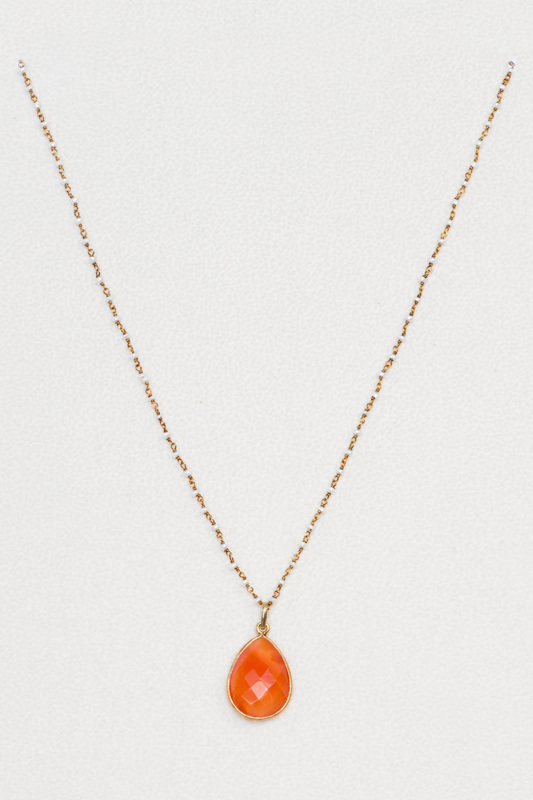 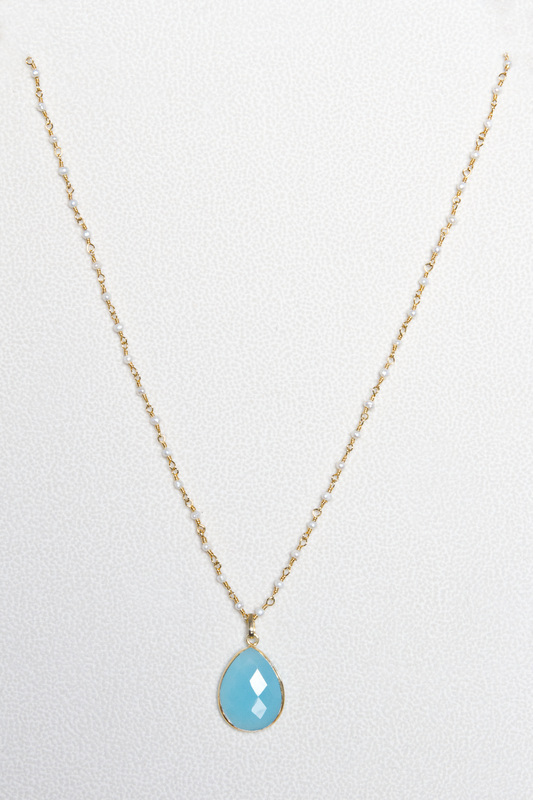 This faceted teardrop chalcedony is set in a vermeil bezel. 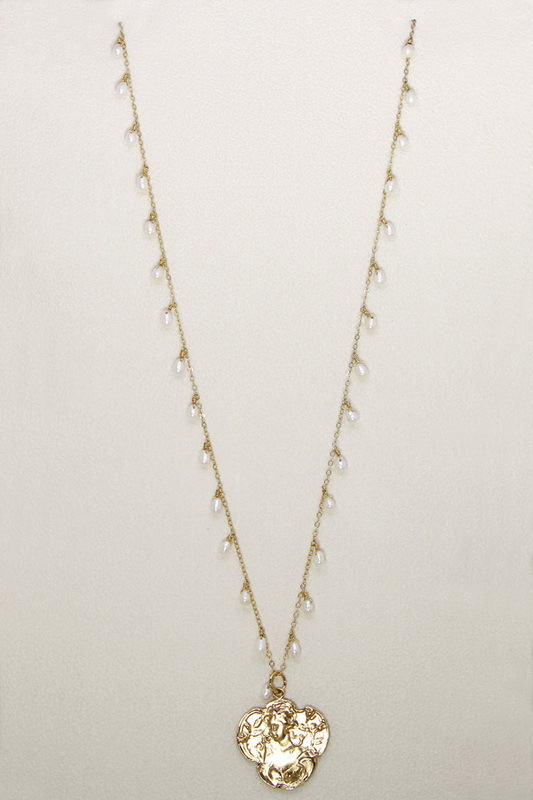 The vermeil chain contains tiny pearls. 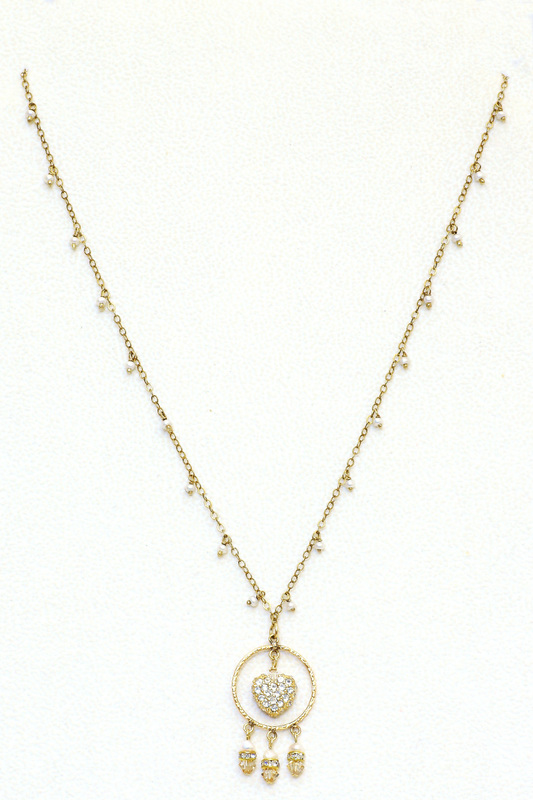 14kt gold-filled lobester claw clasp. 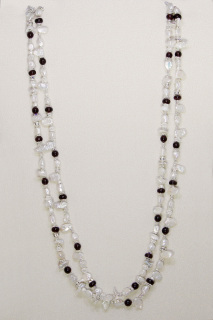 16.5" in length. 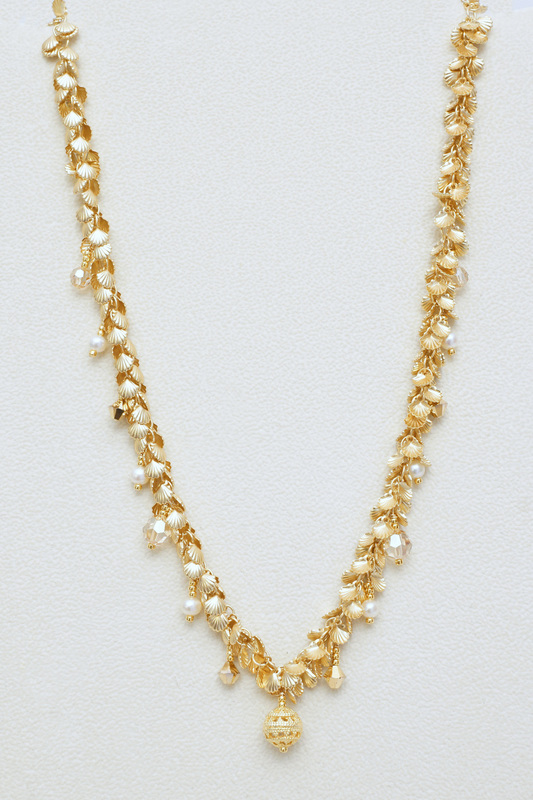 32-Inch hand made gold chain necklace with pearl dangles and 24 karat gold overlay goddess pendant. 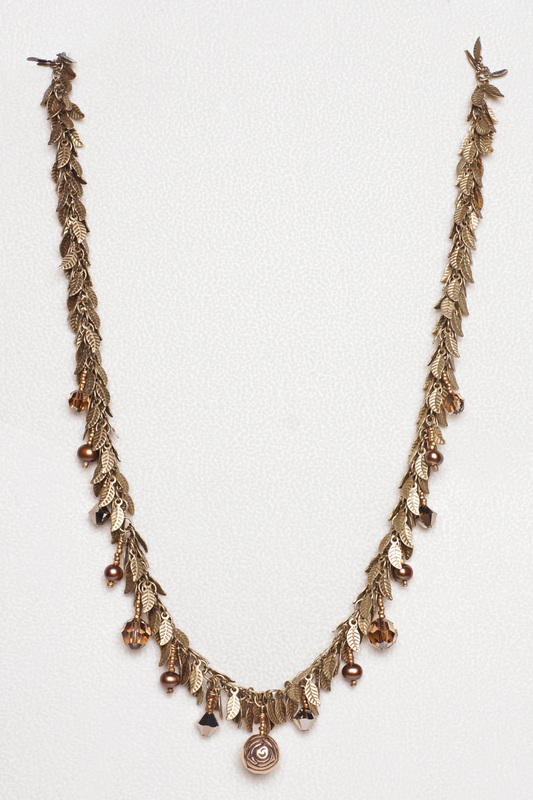 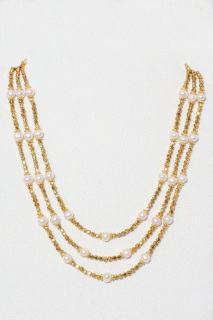 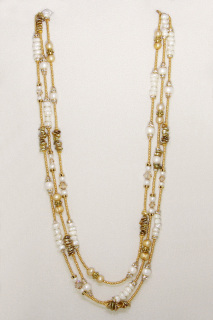 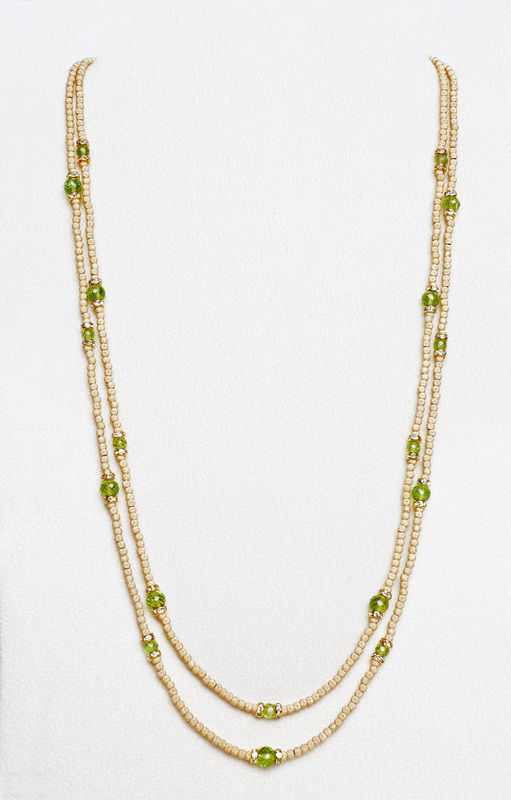 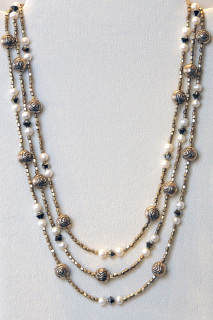 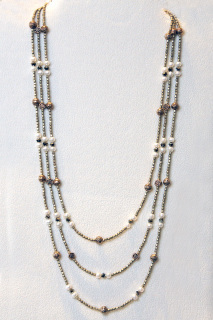 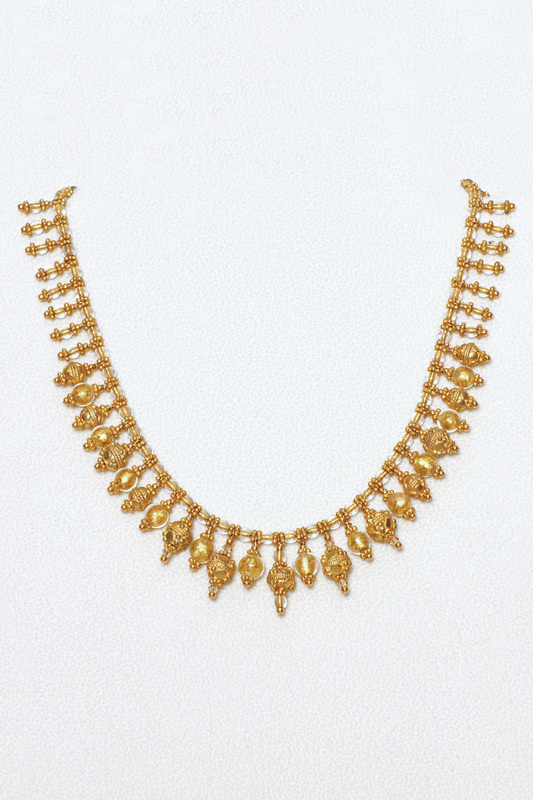 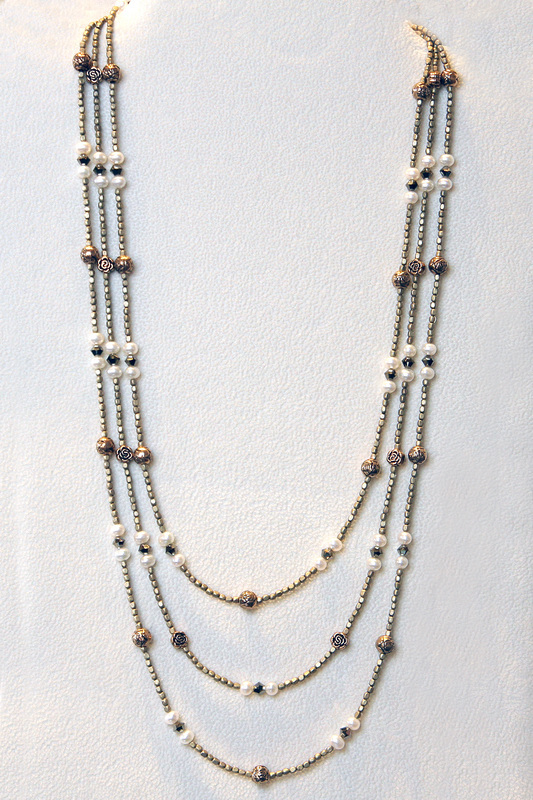 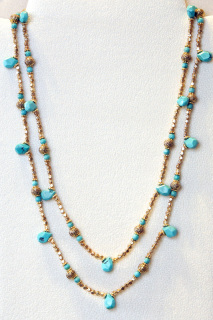 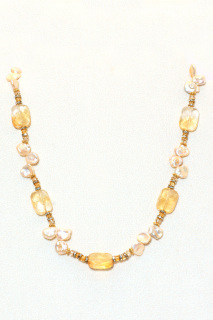 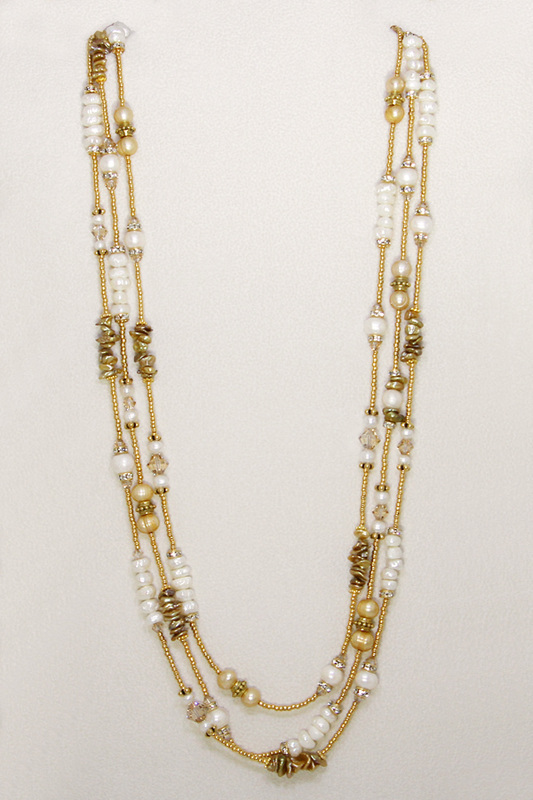 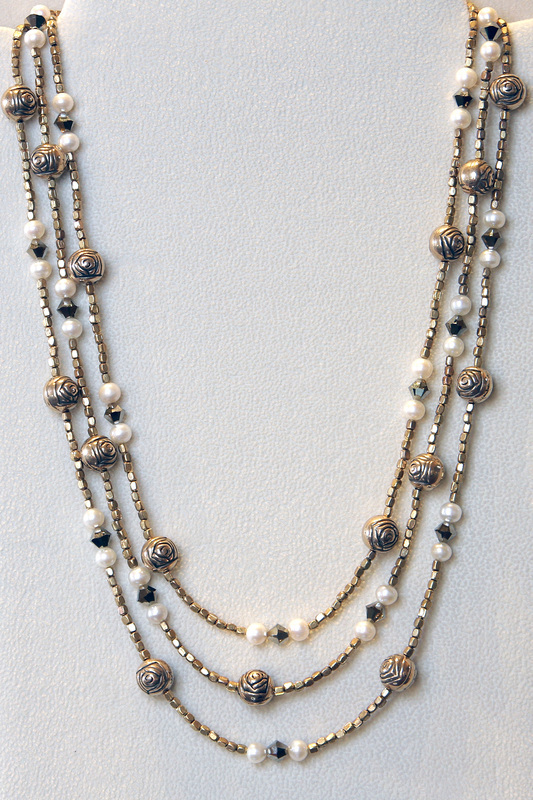 30 inch gold-hued double strand necklace with flower-shaped pearls, crystals and gold-lined seed beads. 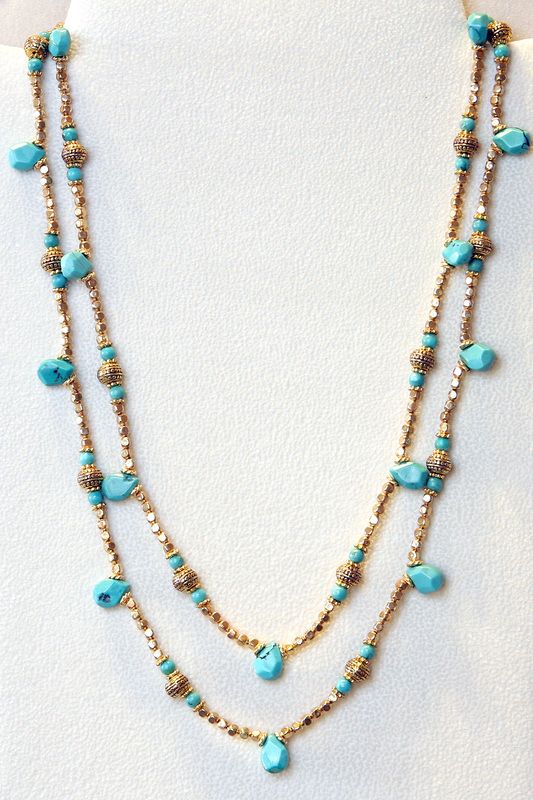 Gold-filled clasp. 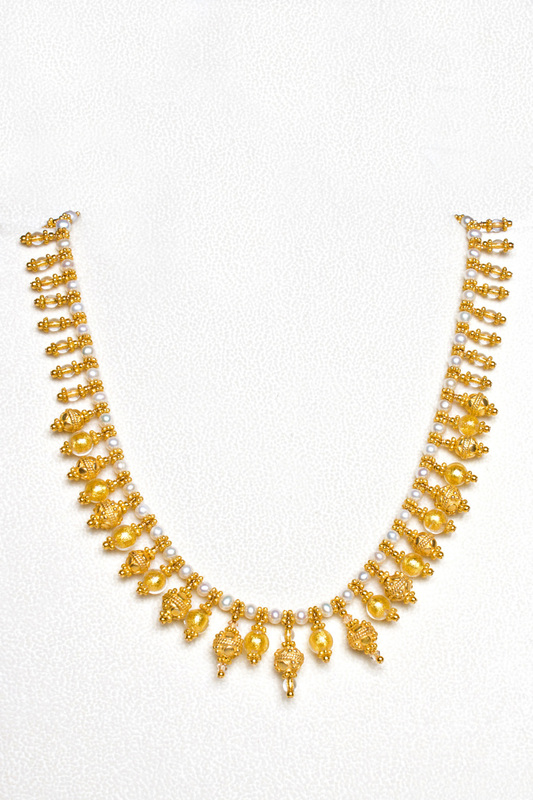 This 24-kt. 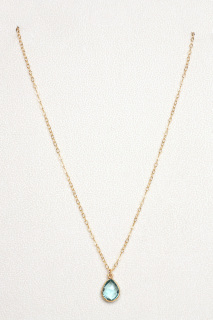 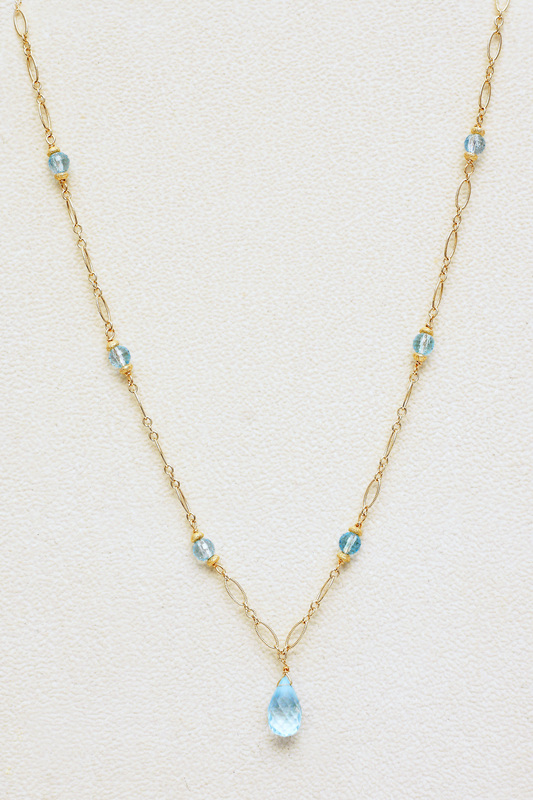 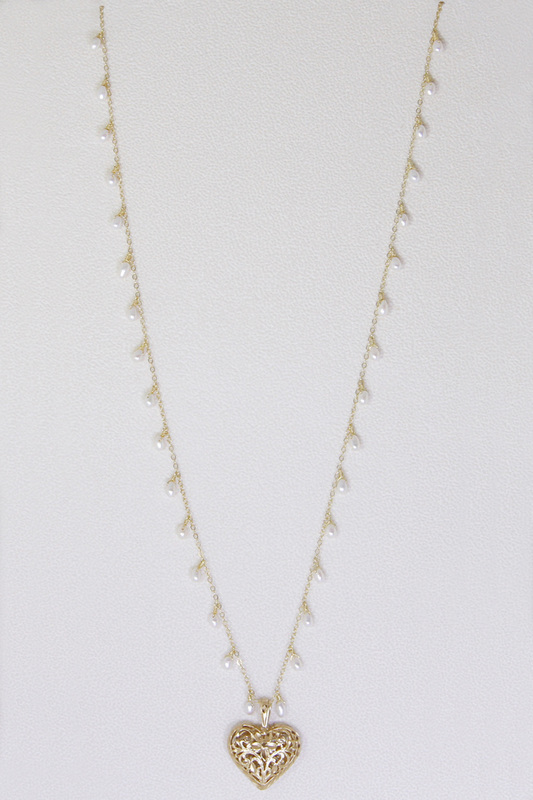 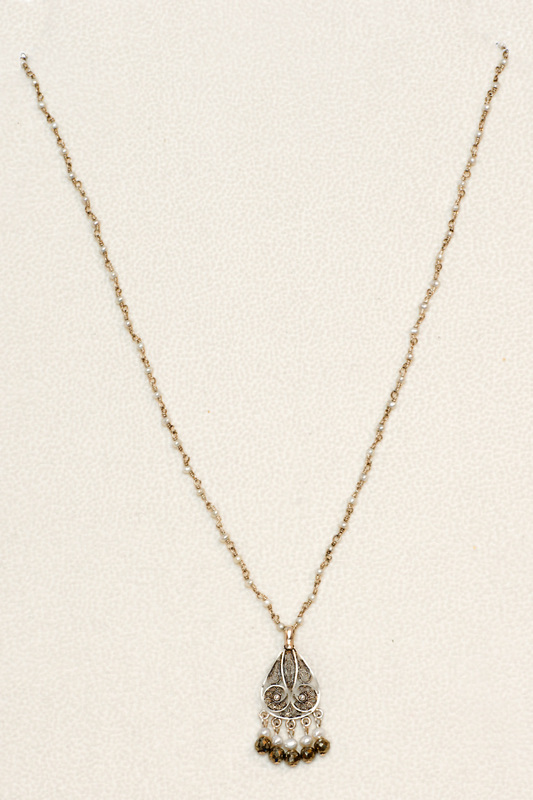 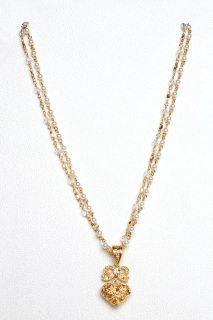 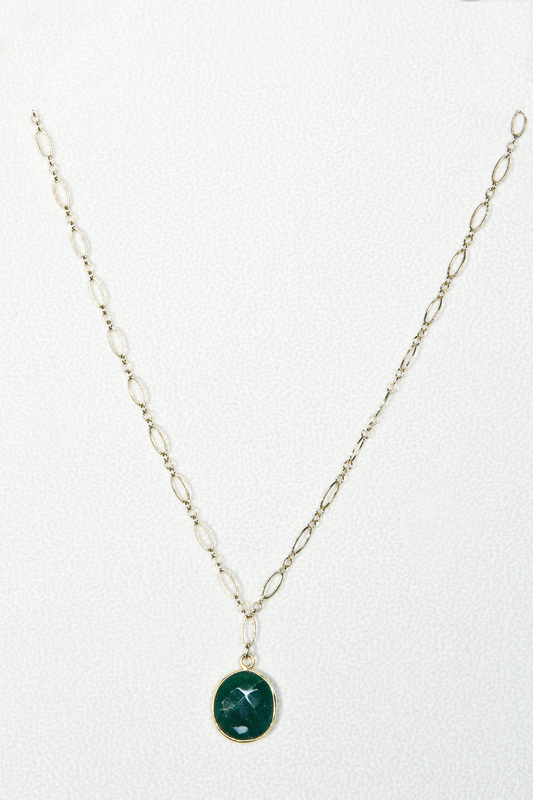 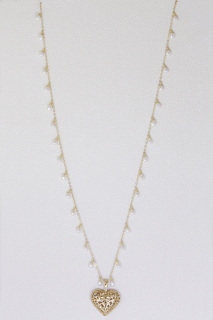 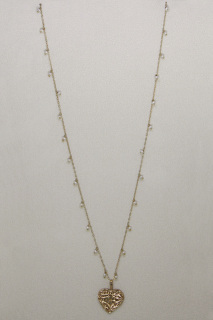 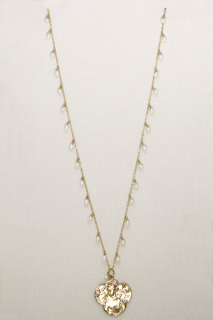 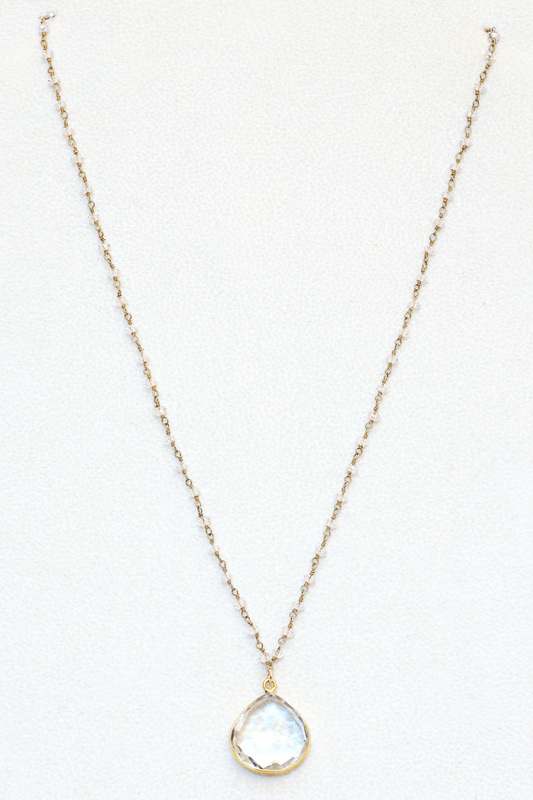 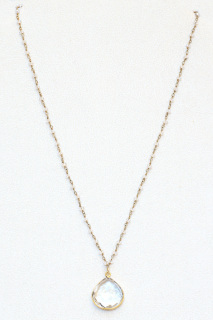 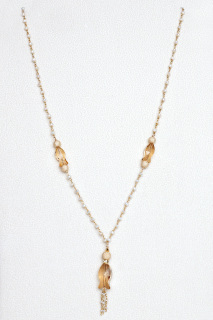 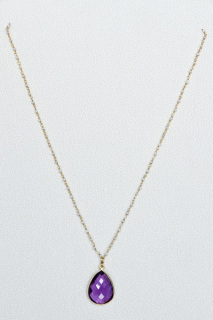 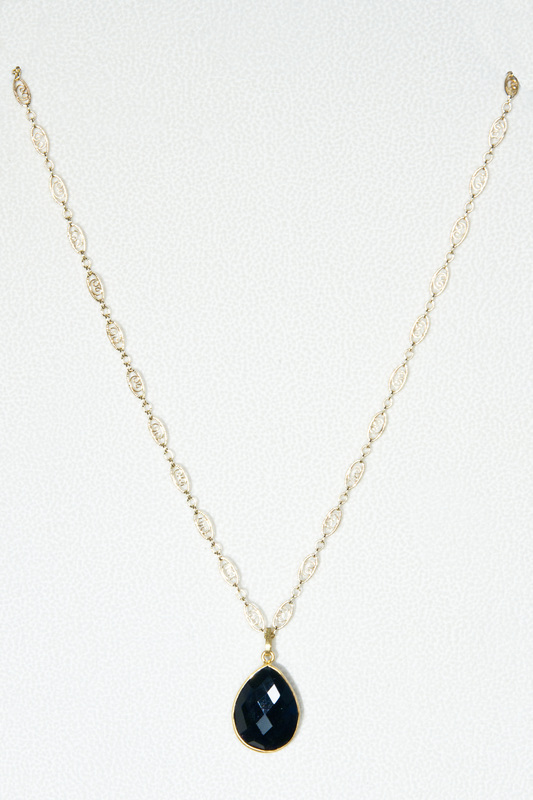 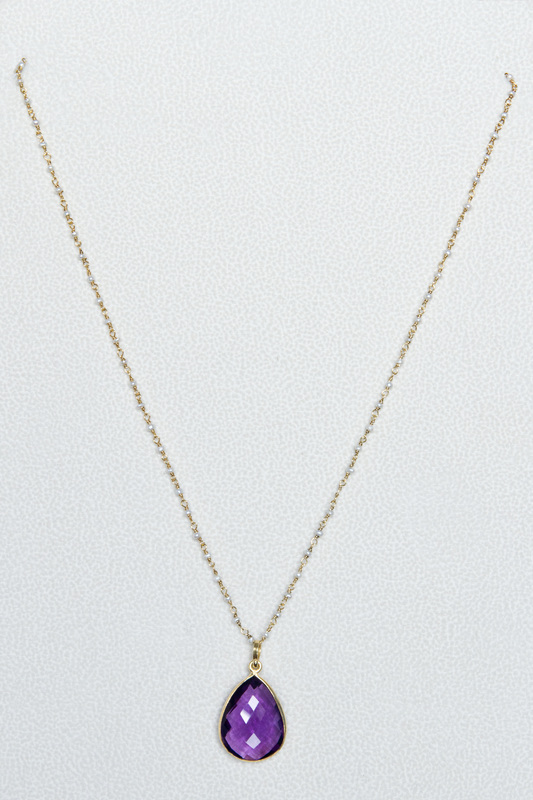 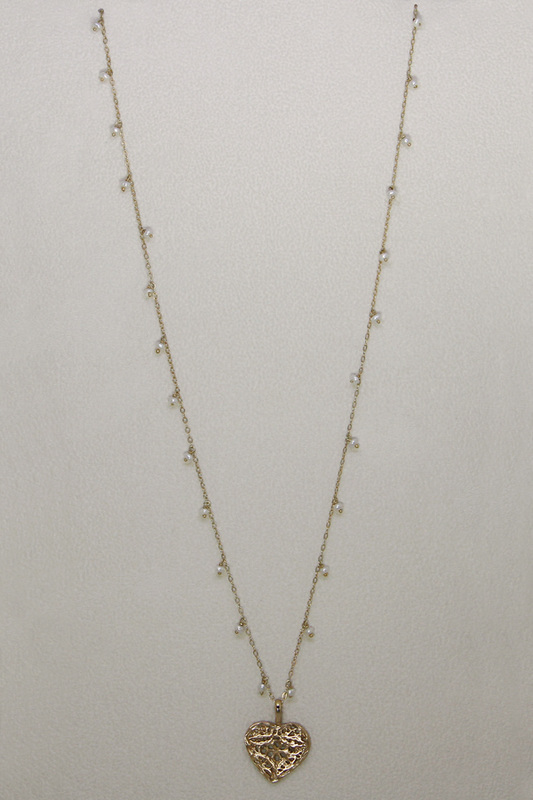 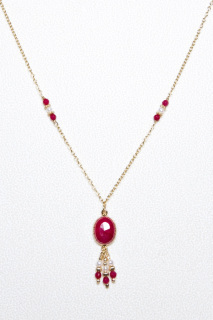 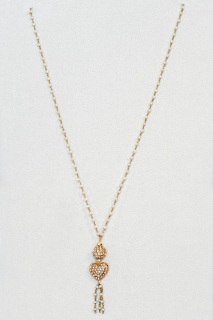 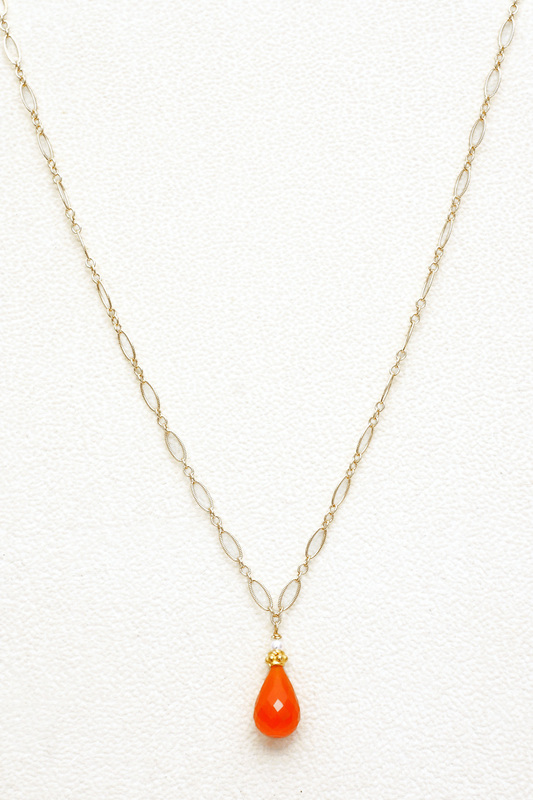 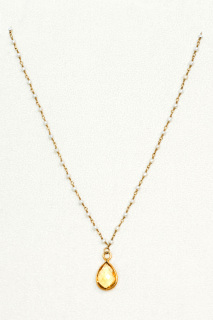 Gold vermeil chain is hand-crafted with teardrop pearl dangles. 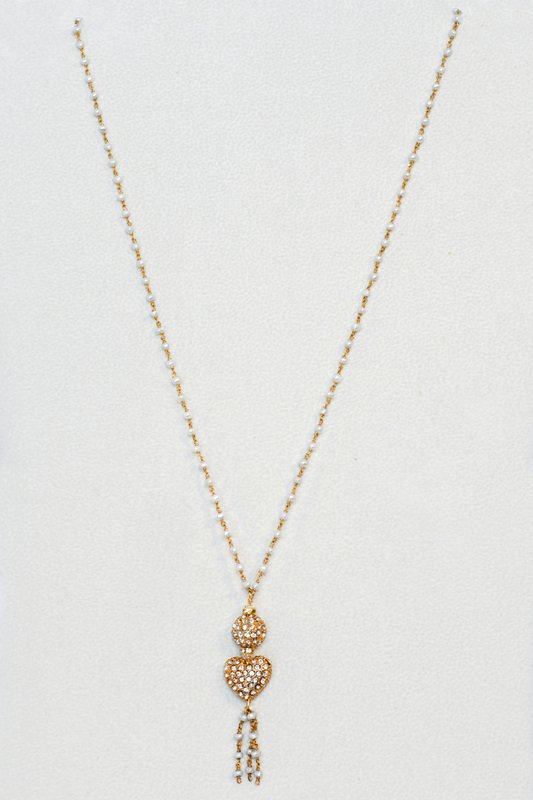 The 33 inch necklace is finished with a 24-kt gold overlay puffy heart pendant that is 26mm wide and 30mm long. 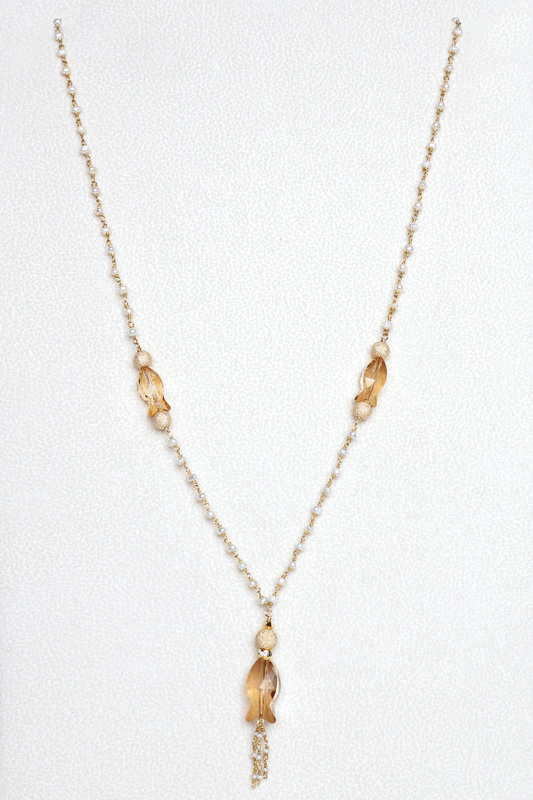 Gold-filled lobster claw clasp is 14mm. 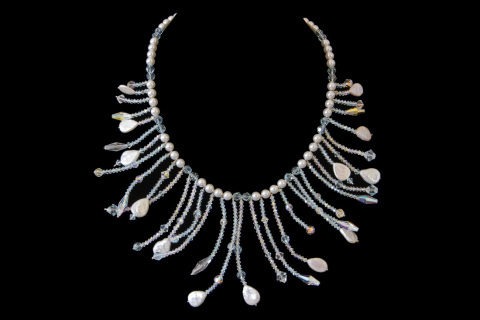 This 23-inch necklace combines luminous white coin and stick pearls with teardrop crystals and silver and crystal rondels. 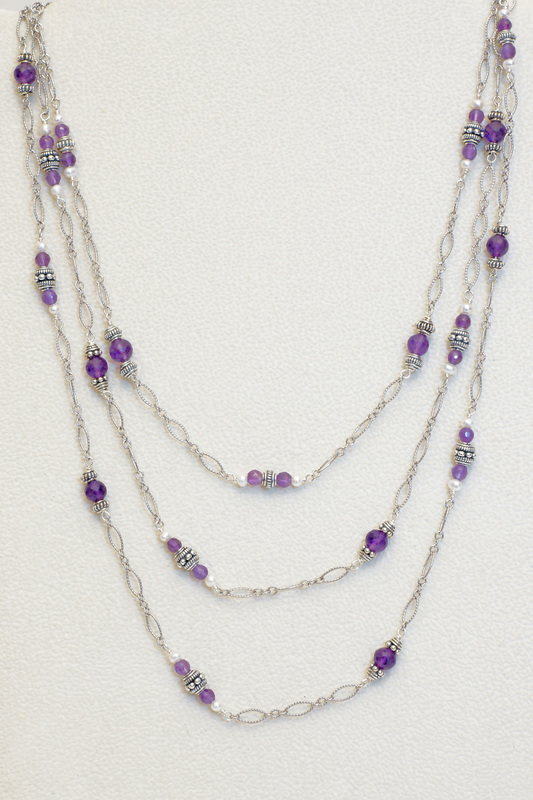 Sterling silver rope twist toggle clasp. 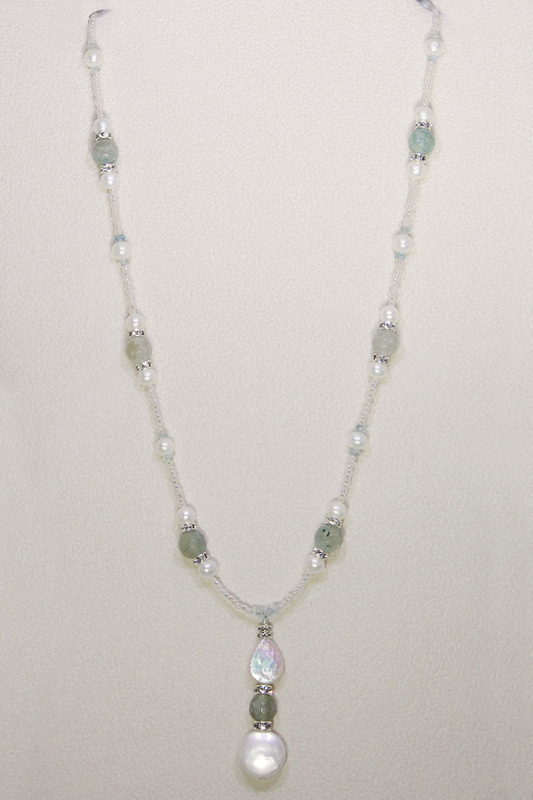 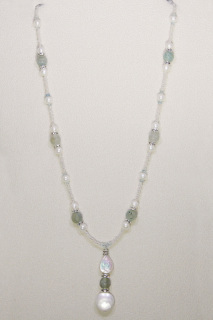 20 inch agate, pearl, and aquamarine necklace with fancy pearl and agate pendant. 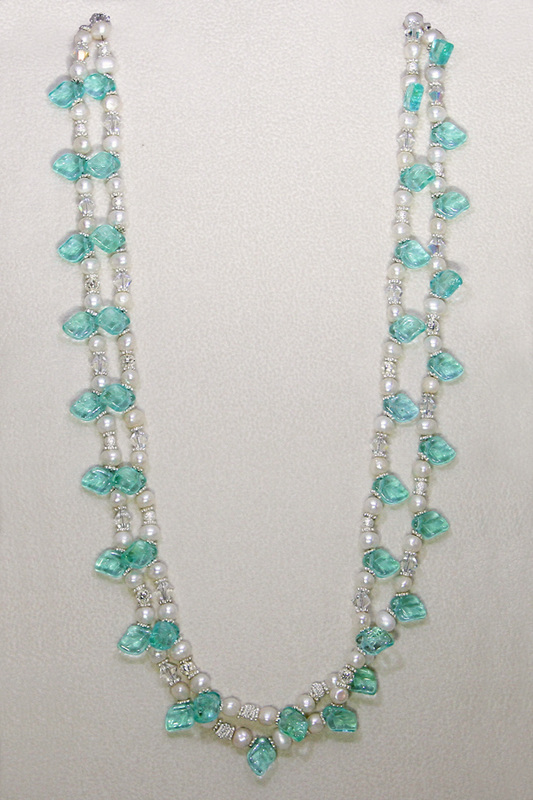 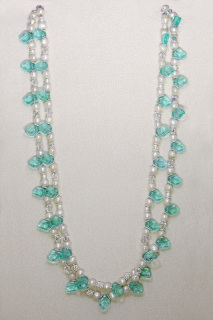 The soft green agates are framed by silver rhinestone rondels. 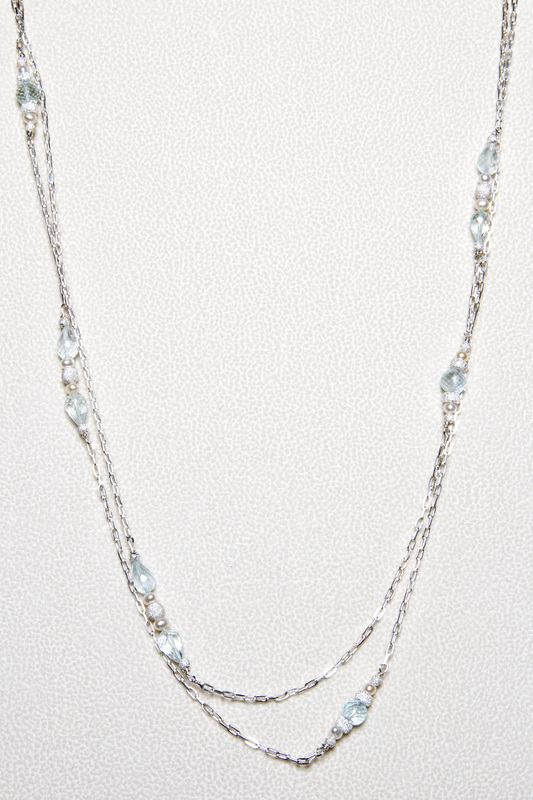 Sterling silver toggle clasp. 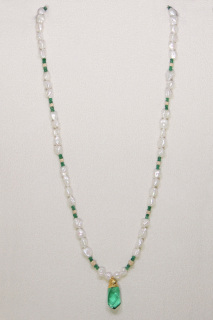 20 inch pearl and emerald necklace with emerald crystal pendant set in 24 kt electroform. 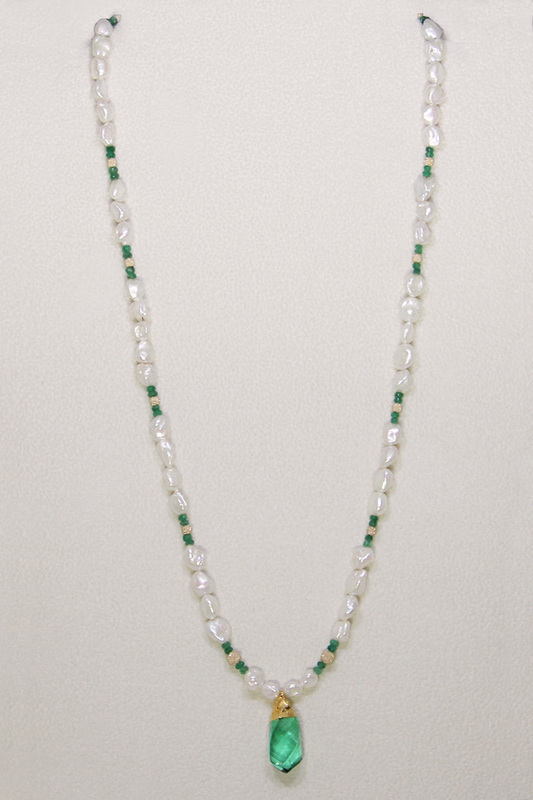 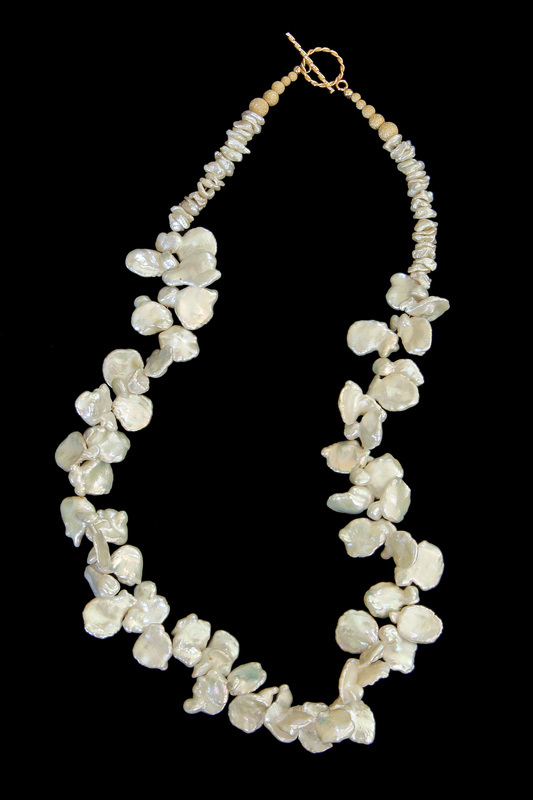 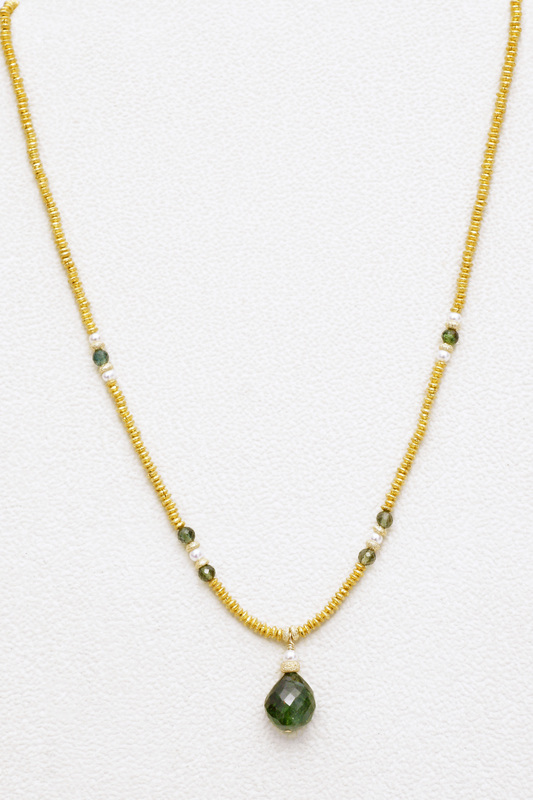 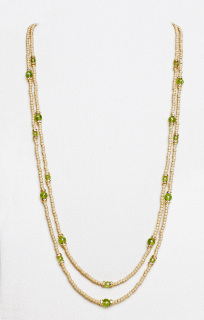 The petal pearls are spaced with 48 emeralds and gold filled sparkle beads. 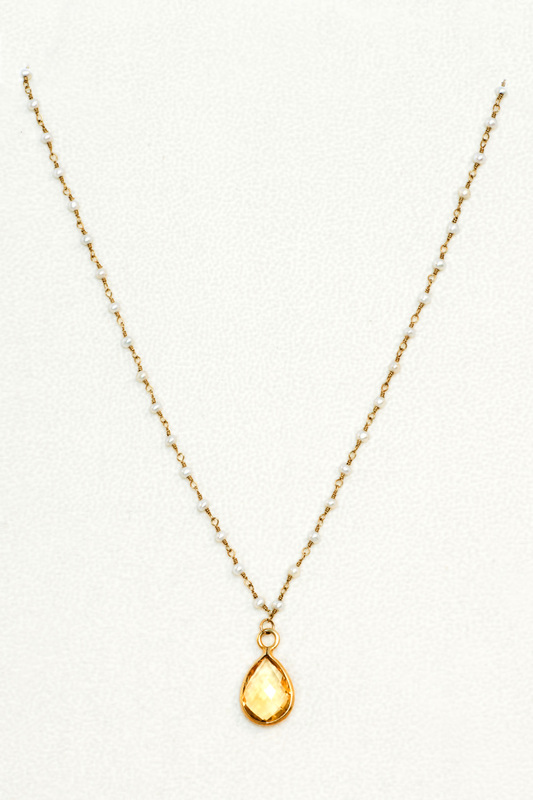 Gold-filled lobster claw clasp. 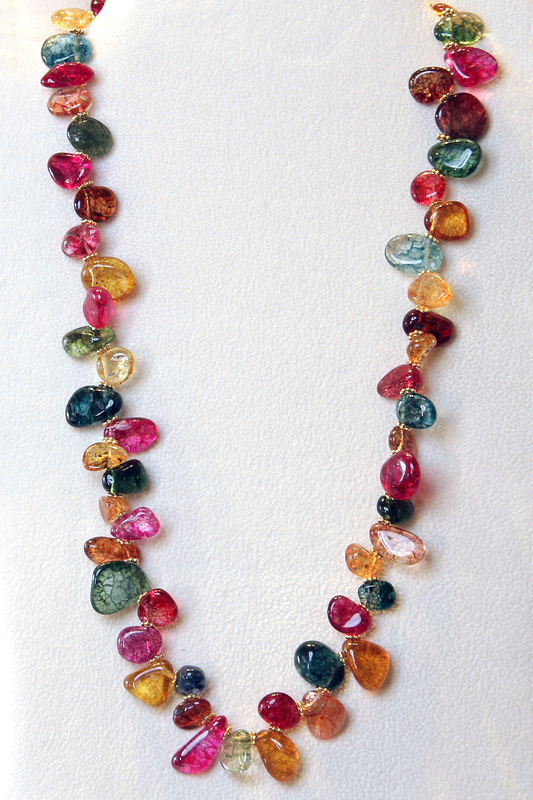 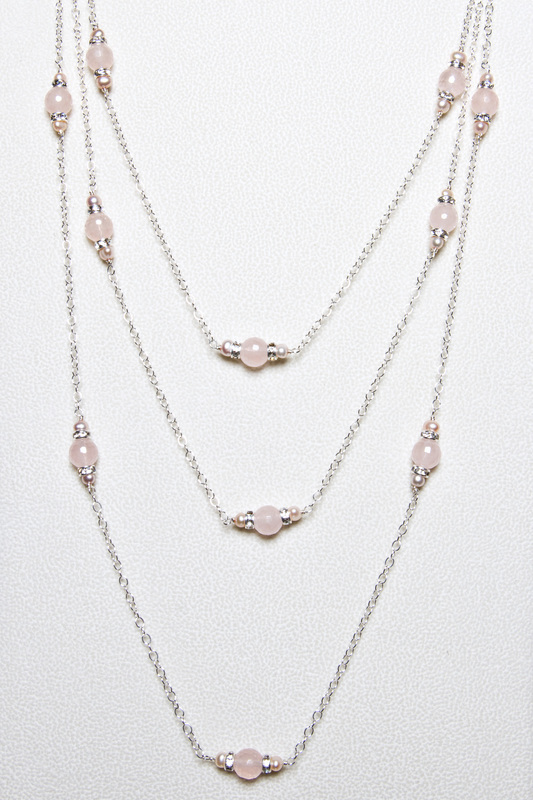 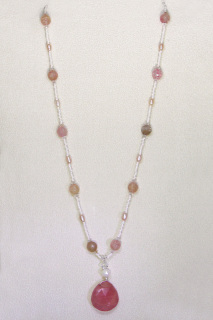 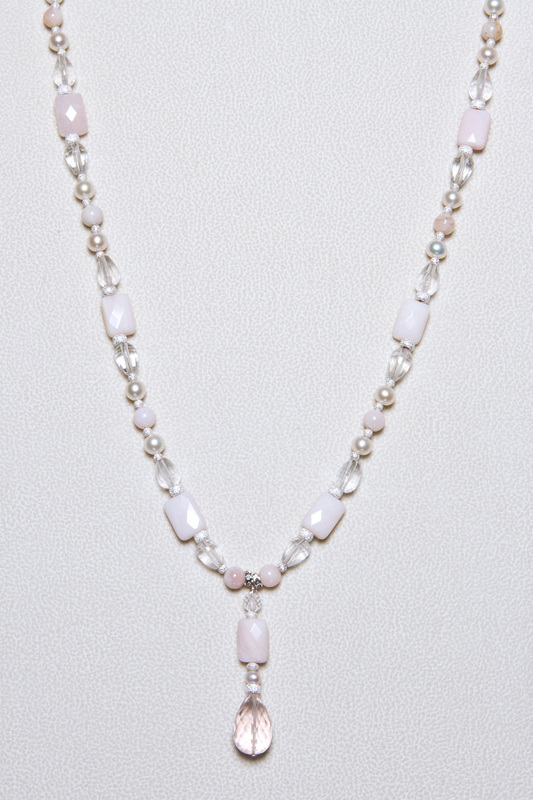 24 inch pink chalcedony pendant necklace with fire agates and pink aquamarines. 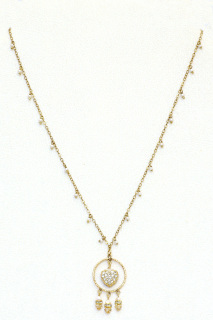 Pendant is 2.25 inches in length. 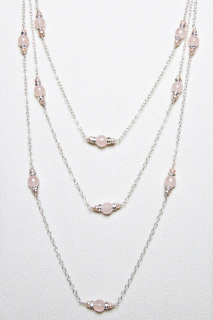 Chalcedony is a soft pink color. 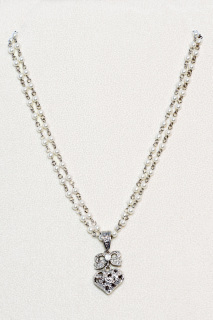 Flower-shaped sterling silver toggle clasp. 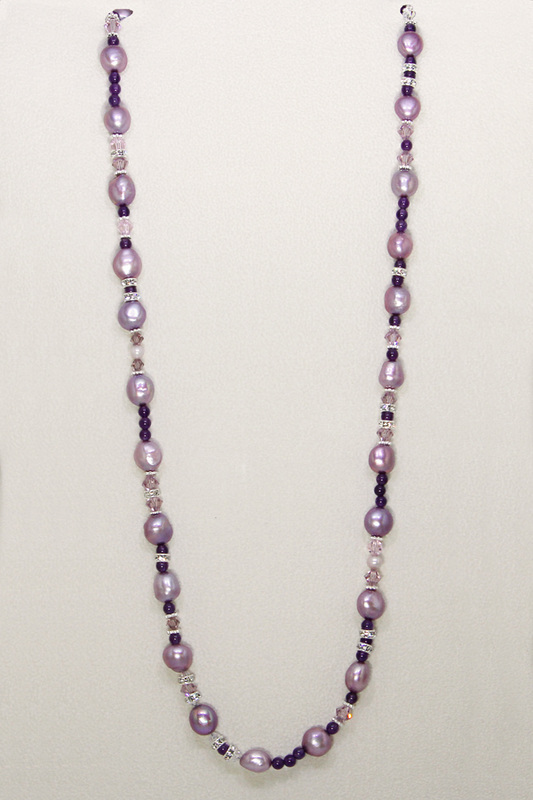 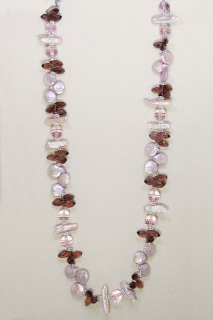 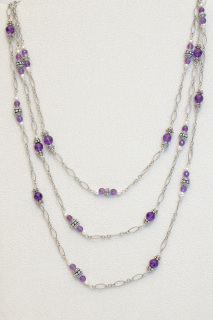 28 inch amethyst and large, fancy orchid pearl necklace. Necklace also contains crystals and silver rhinestone rondels. Sterling silver toggle clasp. 30 inch gold vermeil chain necklace with mini pearl dangles and 24 karat gold overlay filigree heart.